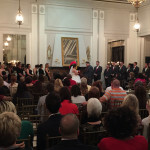 So I never thought I’d be involved in a wedding where the officiant would be the U of L cardinal bird! Congratulations to Kyrstin and Michael Price! 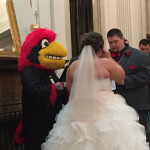 They’re wedding was flawlessly executed by the U of L Cardinal Bird. We helped by putting a wireless mic under the mascot helmet and sound system for the ceremony. Wireless sound in the main dining room made it easy for guests to hear background music and all announcements and toasts during dinner. 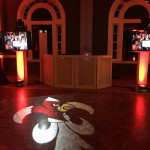 When the guests were invited into the dancing portion of the evening they were greeted by a custom monogram on the dance floor of the Fleur De Lis’ with the Cardinal Bird inside. The room was painted red with uplighting. Needless to say this bride and groom are diehard fans! Congratulations to Kyrstin and Michael and Thank You for inviting us to be a part of your special day!